Stevie Nicks and Lana Del Rey form a coven. 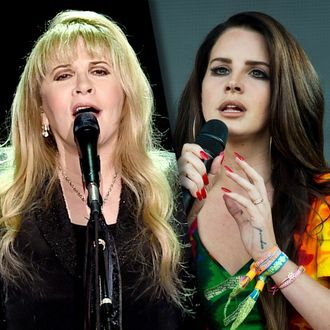 Stevie Nicks, iconic member of Fleetwood Mac and icon to casual witches across America, has found a new moon sister in Lana Del Rey. According to Pitchfork, Nicks will appear in a feature capacity on Del Rey’s forthcoming album, Lust for Life, a title that calls to mind poultices made of flowers and lamb’s blood a lot more vividly when you attach the two witchiest women in pop music to it. While we have many questions about the details of this collaboration, we assume that Lana and Stevie’s historic meeting happened only after Nicks’s assistant laid out the appropriate number of lace throws and lit the proper combination of sandalwood incense and pillar candles, while Lana paced back and forth focusing her energies on how to best use Stevie to help her hex Donald Trump. For now, it seems that Lana has won Hollywood’s informal witch-off (sorry, Haim, that “Pray to God” video is just dress up, and sorry, Azealia “Real witches do real things” Banks, but you went too far). By now, Lana and Stevie probably already have matching fingerless friendship gloves. Now it’s Ryan Murphy’s turn to bring the two into his Coven-related future season of American Horror Story, where they can unite their powers to bring back Misty Day from her own personal hell of dissecting frogs for eternity. Such a kind TV witch deserved much better.